I’m in my early 30’s now and but I’ve totally reverted back to my teenage days where I thought cutting up all my clothes was COOL…Wanna do it with me? It’s SUPER easy and FUN!! Can’t wait to see your wardrobe after you go after it with a pair of scissors. LOL. I had a blast gettin' crafty a few weekends ago and created this fun DIY art collage. I think it’d be a CUUUTE Valentine's day gift for your sweetie or bestie. Plus it’s SOOO easy and quick to make. It’s got an avant-garde vibe so it’s hard to mess up, trust me. See below for exactly how to make it. Over the last few years, my team and I had been working remotely from our homes all across the country. It was fun to create our own schedules, but this summer I started dreaming of a time where we could be together working side-by-side in the same office. So, when the plans finally came together, I was excited to design an office space that was bright, modern, and fun to step into every day! To start off, I went for a clean white look with sit/standing desks from Ikea and sleek white office chairs from Amazon. I got some killer Sonos Speakers installed in the corners of the office to help keep us vibe-ing throughout the workday. I already had a dark cowhide rug, so I wanted a black geometric chandelier to compliment it and found the perfect one at West Elm. The room needed some bold unique personality and I thought one of the main walls in the office would be PERFECT for a college-like mural concept. As a fine art major, I love collage and mixed media pieces, so I knew I wanted a mixture of paint, decals, splatters, dips, wall panels, etc. Measure your wall using a tape measure to get the exact dimensions of the surface you’ll be working with. Then order your decals. There are a lot of fun places to get all kinds of graphics and decals for your walls. 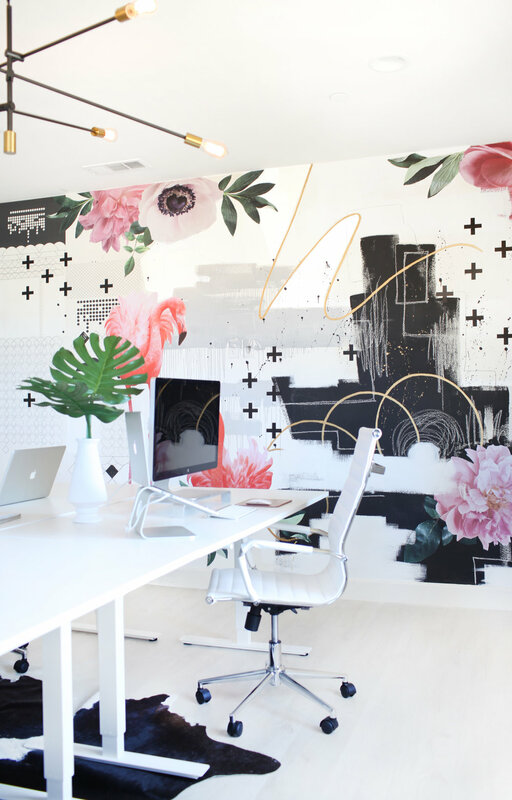 After perusing a lot of sites, I fell in love with the fun and quirkiness of these floral & flamingo decals from Urban Walls and geometric wall panels from Kirath Ghundoo. TIP: I took my wall measurements into consideration before purchasing. Before anything else, I put up the wall panels, which are essentially like big sheets of wallpaper minus all the paste. The nice thing about these ones are that they won't ruin your walls if you decide to take them off! I knew I wanted mine on the edges to frame out the wall. I thought an artful mess as an under painting would bring a strong dynamic to the mural. So, I used gray paint and mixed it with water to get it a watery consistency. Then I painted a swipe across the wall and let it drip down. I also hand-painted black and gold as an accent on the wall, and then mixed water with black paint and went to town splattering on the wall. It was a ton of fun! Tape the Urban Walls decals in place on your wall so you can get an idea of where you’d like to put everything before making that semi-permanent install. You may want to rearrange and try a few different variations before committing and installing the decals. Their tutorial video was really helpful. After I had figured out the placement of the final decals, I was ready to commit and ready peel and stick! That's it! I am super excited with how the wall came out. It adds that fun and funky vibe to each day we spend in the office. What do you think of this? Will you try it? Let me know in the comments! As a creative entrepreneur I have my fair share of days filled with working the grind at home and then needing to quickly hop on a skype call. It's nice to look put together, and sometimes the messy top knot can feel overdone or even worse make me feel like I am still in my pajamas. So, in an attempt to look unique and put-together in a time crunch, I created what I’m calling the Sideswept Double Topsy-Bun. The best part? There are no pins needed for this look. Just two pony tail holders and hairspray. Let’s get started. Viola!! This hair style STAYS!!!! I’ve even slept in it and it still looks great the next day with a little more of a tossed look. I can’t wait for you to try this! If you tried it, I’d love to know.